Updated May 2018. 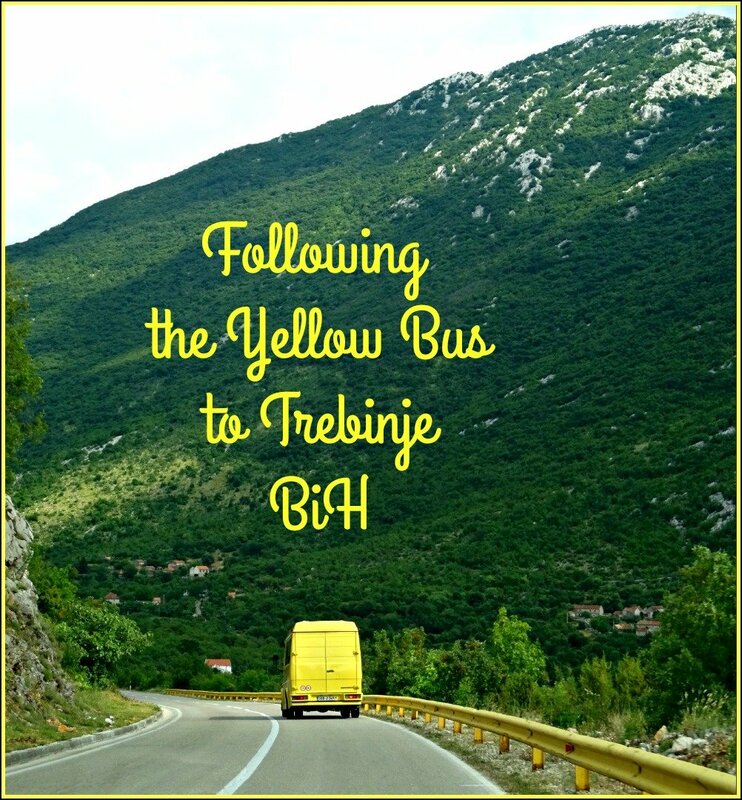 Like Dorothy in the Land of Oz, we followed the yellow brick road bus from Ljubinje to Trebinje BiH (Bosnia), in the far south of Bosnia and Herzegovina. Trebišnjica was once the longest sinking river in Europe (98km). Hotel Leotar is named after the mountain that overlooks the town. What does BiH mean in Text? Most foreigners say Bosnia, others Bosnia and Herzegovina, but BiH is the official three letter Country Code abbreviation for Bosnia and Herzegovina. It’s all a little confusing but in reality the three seem interchangeable. 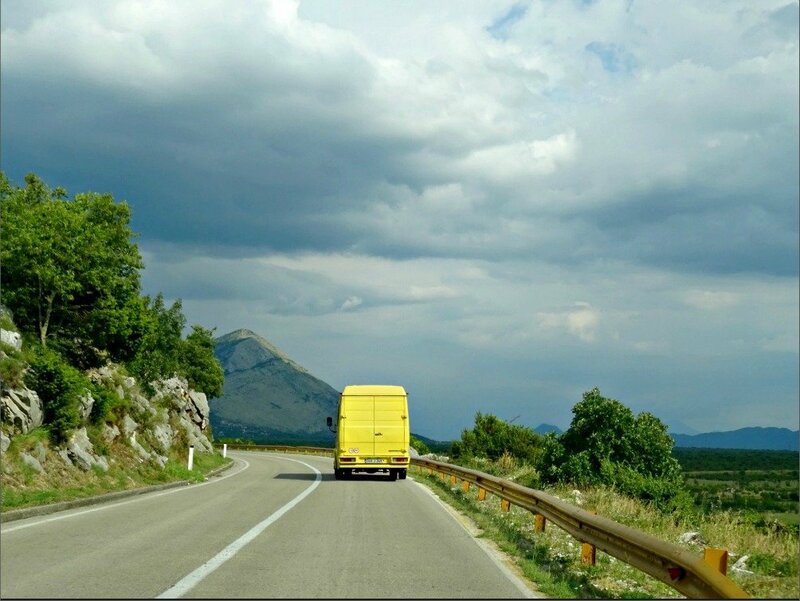 It was fascinating following the yellow bus and soon we realised yellow was also the colour favoured by Bosnia for guard rails and road signs. We were in a world green and blue, trimmed with yellow. The bus stopped occasionally over the hour’s trip collecting passengers (all of them male) carrying plastic bags, shopping bags and neatly wrapped parcels. Why were there no women on the bus? It’s still a mystery to us. 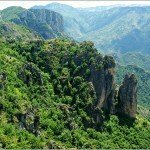 The photos below show the landscape en-route. BiH pronunciation goes something like this: Boz Nee A and Hurts o Go Veena. I’ve added a map because I’m a map freak. When reading about places I’ve not been I always appreciate having one. This was our route through Bosnia. Read our post about the amazing Mostar and Stolac. 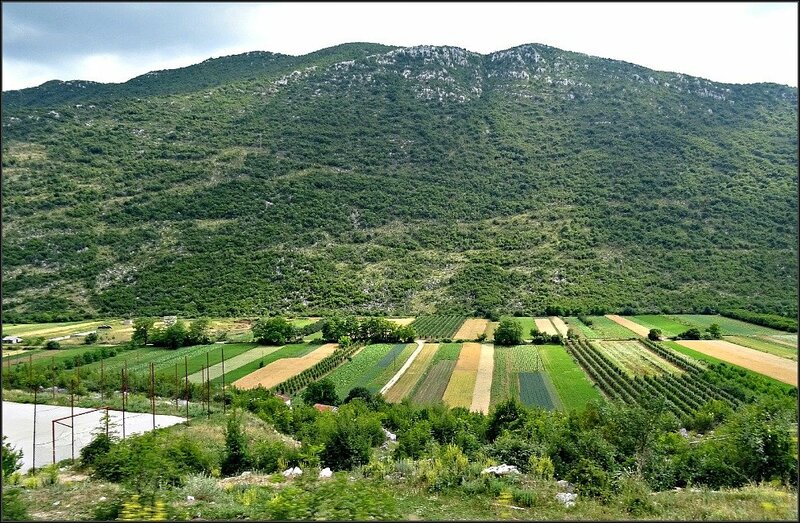 The valley at Ljubinje is intensively farmed with food crops. 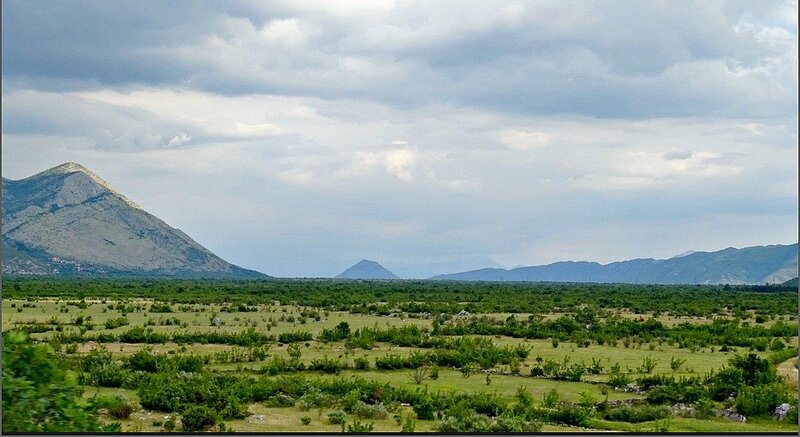 Farms and forested hills disappeared the further south we went until nearing Trebinje vineyards appeared. Just the yellow bus, the mountains and us. This English and Serbian Cyrillic sign announced Trebinje at the north-western entrance to the city, on arrival from Mostar or Stolac. The Cyrillic alphabet was first established in 1818. Stop for a break and check out the waterwheels and vineyards. The roses planted at the end of some rows of grapes, serve as an early indicator of mildew, a problem shared by the vines. I know it’s the same in the Margaret River district of Western Australia and is probably a world-wide indicator. Trebinje’s wine making tradition goes back to the 14th century. Žilavka wine was delivered to the Habsburg Monarchy in Vienna. The industry had a setback during Turkish occupation when public consumption was banned but the industry is alive and well today. Wines produced are Žilavka, Chardonnay, Merlot, Rose, Grappa and even Cherry Brandy. Local Vukoje Winery is a leading Bosnian wine producer specialising in Žilavka. Even the monks of Tvrdos have turned their hand to wine production! 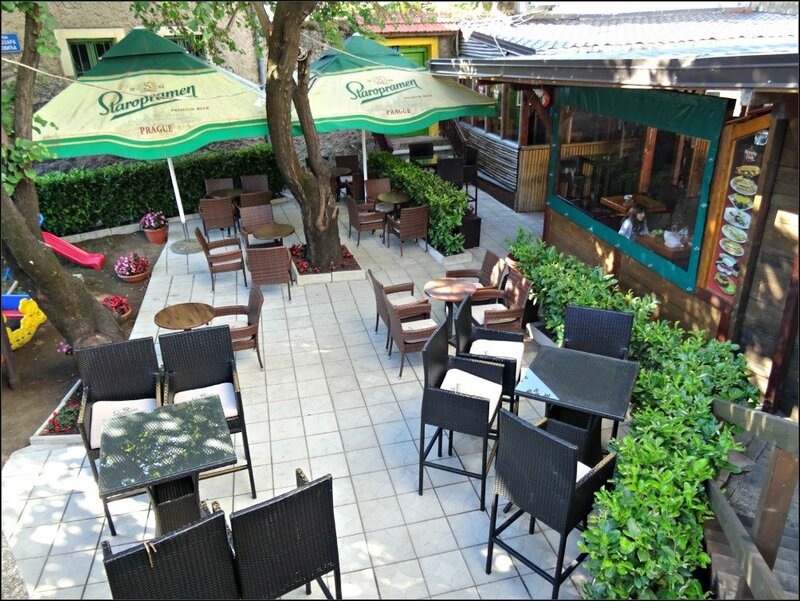 There are twenty commercial wineries in Trebinje. Ask about wine tastings at Tribinje Info Centre. 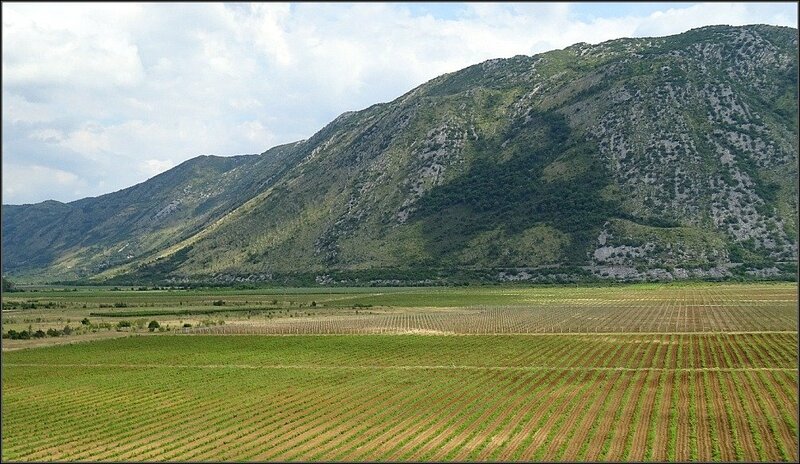 Vineyards with Trebinje in the background. 93% of the farming land is irrigated. My tongue-in-cheek borrow from the Wizard of Oz was intentional. Trebinje is quite enchanting. 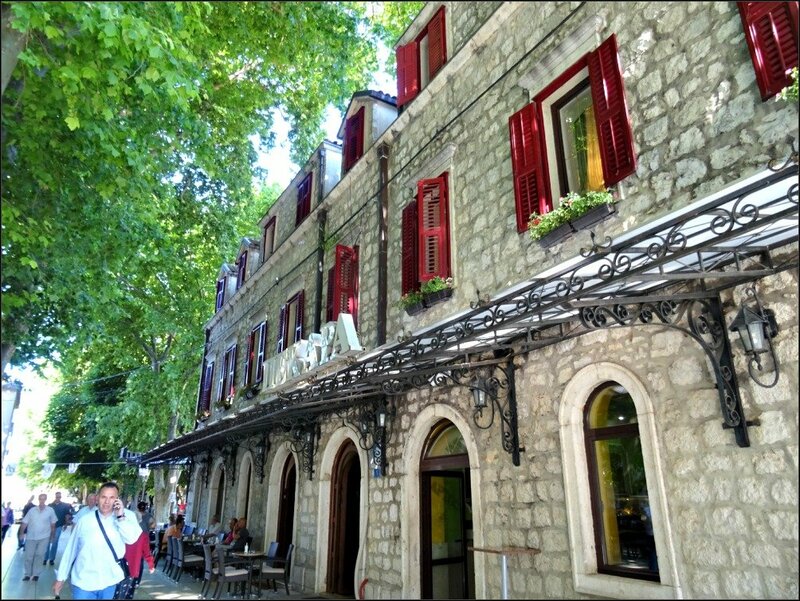 Initially we intended passing straight through to Montenegro, but after seeing the huge plane trees, impressive reflected mountains, cafe culture and the promise of a lovely old walled town or stari grad, we decided to stay and were so pleased we did. We had no accommodation booked in Kotor, enabling us to linger in Trebinje and then enjoy an unhurried drive through the river valley and mountains to Kotor the next day. We mostly had accommodation booked in our ten weeks in Europe but this section from Split to Kotor was unplanned and we were loving the freedom. The busiest market day is Saturday, but you can pick up fresh produce any day from 8 am to 1 pm. If I lived in Trebinje this would be my daily shop. Everything looked fresh and inviting. We found whole rounds of cheese and crates of cherries no doubt destined for strudels and brandy. Cherry strudels are prolific and dreamily good throughout Croatia and Montenegro. Actually, we began eating them back in Slovenia at Ljubljana’s Open Kitchen. They say the specific flavour and quality of the local honey in Trebinje results from the herbs growing wild in the mountains. Even Matična Mliječ or Royal Jelly, the food of Queen Bees is for sale in the market. Consuming Royal Jelly is believed to slow down the ageing process and it is endowed with properties as far ranging as controlling cholesterol to curing infertility. Trebinje Bosnia has a climate that lends itself to growing herbs. 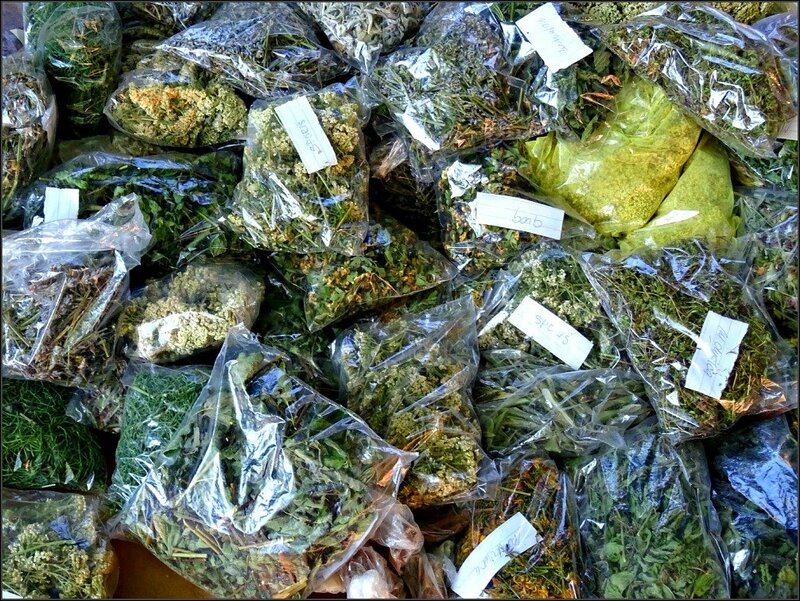 These bags probably hold Rosemary, Sage and Lavender. A sinking river decreases in water volume as it progresses due to water escaping through the karst rock base. 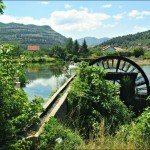 The Trebišnjica has been altered by the forming of a hydro-electric dam to the north at Bileća and the concreting of the river base for 67km after it’s departure from Trebinje. 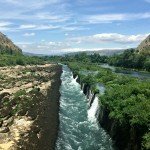 What an amazing river – it’s worth reading about HERE. There are natural swimming spots and man-made ones at Lastva resort (12km), and the swimming, sunbathing and fishing resort of Jazina. Far too cold for us Aussies! The above photo was taken from Kameni Most otherwise known as Stone Bridge (shown below) over the Trebišnjica River. Hotel Leotar is just out of picture on the right and the old town is on the left bank. Looking back to the old town from the left bank near Hotel Leotar (below). The tall building is the late 19th Century Austrian Militatry Barracks, built on Roman and Turkish foundations and now housing the Herzeovina Museum and cultural centre. We usually stay in small family run hotels, so Hotel Leotar was unlike any place we’d previously stayed at. It held 150 rooms leading from tall, wide and long, long corridors. There was a conference venue of 250 seats, two restaurants with 250 and 280 seats and two terraces with 150 seats each. And the massive staircases! They were wide enough to fit ten people cross ways. Of more importance to us, with our lack of Bosnian currency (the convertible Mark) or Euro, was that we could book our Schnitzels and drinks to our room and pay by credit card on departure. I guess the schnitzels hark back to the Austro-Hungarian period – anyway they were damned good. Our suite was the last room available and reception matched Booking.com’s price of 50 Euro/night. It was very elegant if slightly jaded. Although not our normal style of accommodation we did enjoy staying there and won’t forget it in a hurry. That’s Hotel Leotar in the centre and Leotar Mountain on the left. If we were to return I’d probably stay there again for old times sake. Although we only spent one day in BiH, it was easy to see that Trebinje in particular has a thriving Cafe Culture. Back on Kameni Most looked down to the pontoon cafe hidden between river and the walls of the old town. 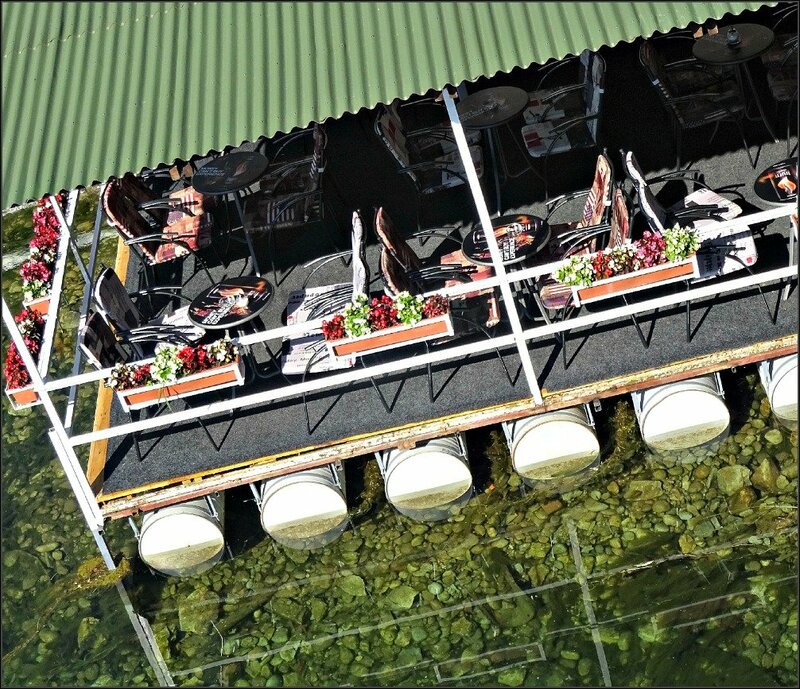 I imagined them serving local river trout, spit lamb or potato bread cooked on stone and myself sipping glasses of local wine. The Havana Club an interesting looking Cafe street-side near Kameni Most and outside the walls of the old town. 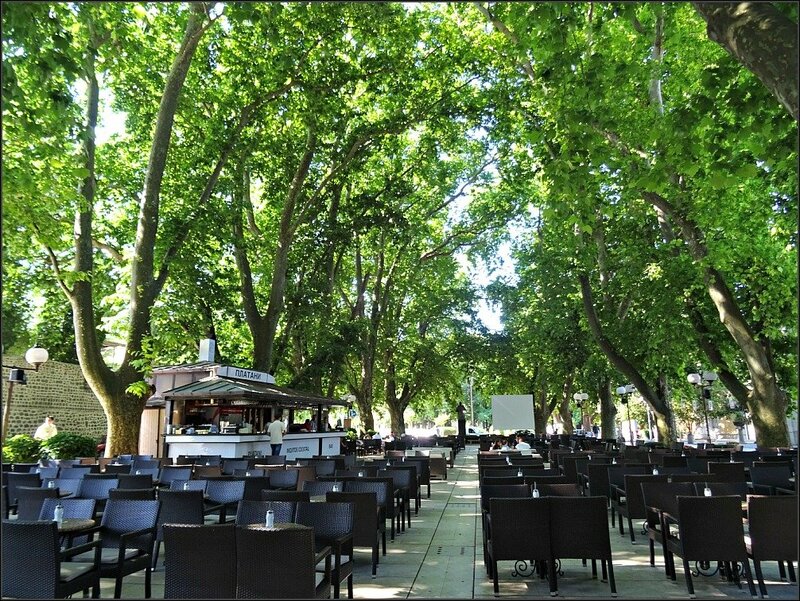 A 500 seat summer garden bar at the front of Hotel Platani is shaded by 100 year old Plane Trees while it’s Mojito bar cosies up to the 18th Century walls of the old town. It seemed that everything was on a large scale in Trebinje, out of balance with the relatively small population of 36,000. One of the two Hotel Platanis. Meanwhile the two Tourist Bureau employees gave us brochures and helped choose our route to Kotor. They explained that six of the Plane Trees were not well and might need removing. I was upset at the thought, but they happily assured me that new ones would be planted. This bureau was one of the best we visited in our 10 weeks in Europe. I’m guessing that the loss of a few replaceable trees isn’t a concern in a town that was at war only 20 years previous. 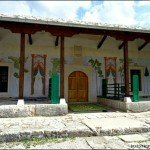 On that note, we didn’t see war damaged buildings here like in Mostar and Stolac and this post by the The Bosnian Aussie offers an explanation. 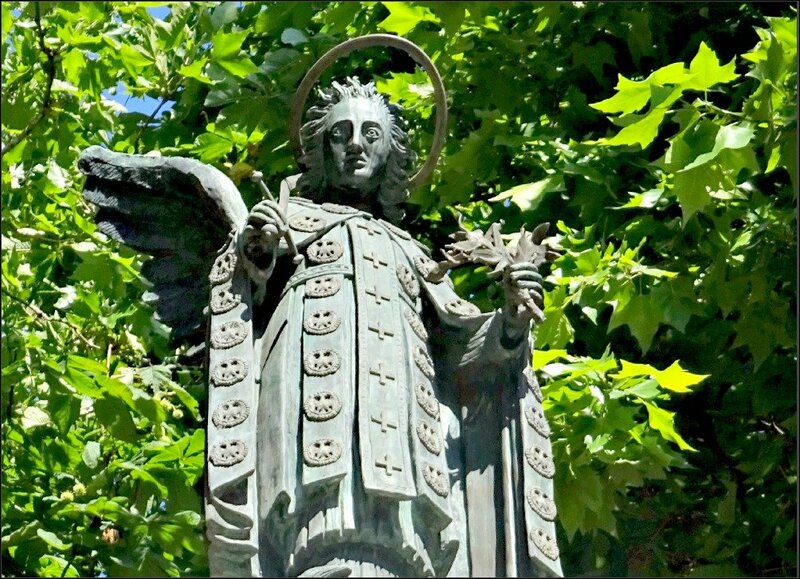 This sculpture sits on top of a tall column in the middle of town as a monument to fallen soldiers from WWI. I wish I knew more about it. This trip south from Ljubinje was basically un-researched and not knowing what to expect added so much to the experience. 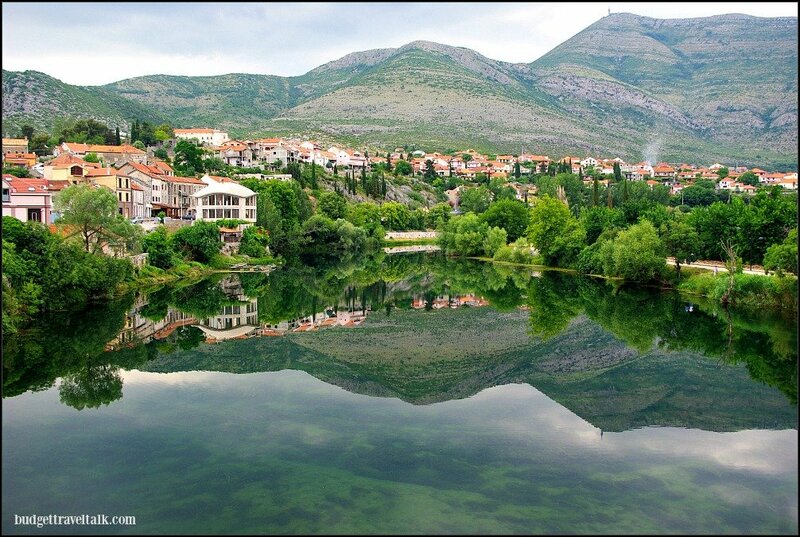 Trebinje has a mediterranean and highland mountain climate. 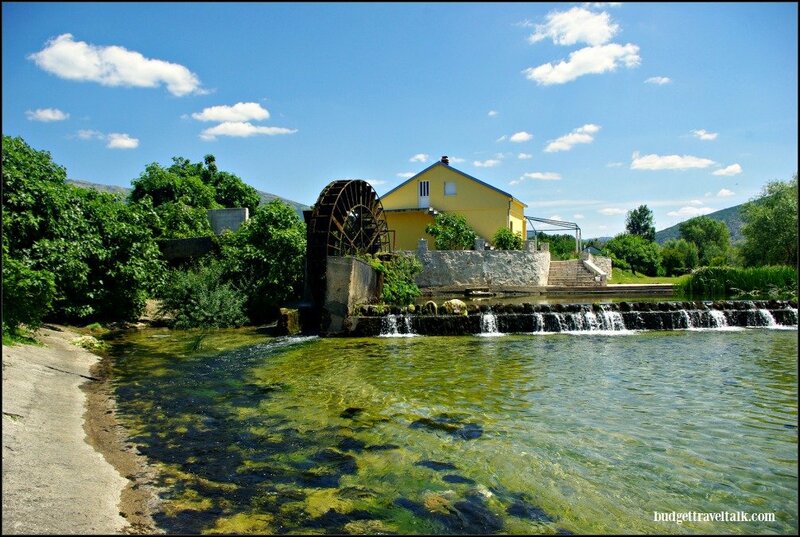 This means in early May (Spring in BiH) Trebinje experiences a temperature range of 14 degrees to 25 degrees Celsius with showers. Trebinje Info Centre is at Jovana Dučića bb, 89101 Trebinje, in the city square full of century old Plane Trees. The staff speak English perfectly and are super helpful. Ask about kayaking and tours of the surrounding mountains. BiH (commonly known as Bosnia) has two political entities. One is the Federation of Bosnia and Herzegovina known simply as the Federation and the other Republika Srpska (Serb Republic) where Trebinje is located. While part of the political entity of Republika Srpska, Trebinje is also an economic/cultural centre and southernmost city in the geographical region of East Herzegovina (east of the Neretva River). It is connected by bus to Dubrovnik and Mostar daily. Trebinje-Belgrade and Trebinje-Sarajevo buses pass through the gorgeous mountainous Sutjeska National Park. You can read about the rest of the trip and see my suggested route encompassing Dubrovnik, Mostar, Trebinje and Kotor here. I am cohost of Nancie’s Travel Photo Thursday, at Budget Travelers Sandbox, together with Ruth from Tanama Tales and Rachel from Rachel’s Ruminations. 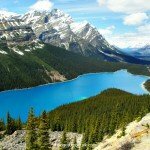 If you have a blog you can add a link to one of your posts containing a travel photo below. Feel free to link back to this site in your blog also. Hi Nancie, We arrived in BiH on a Sunday with no currency and the intention of driving straight through so we couldn’t purchase anything at the market. The produce on sale looked very fresh and I’m sure most people would shop there. What a picture perfect spot to travel around. I think I could definitely end up spending way more time than I should in the shade of those trees at the enormous garden bar. And that market, I have a total weakness for produce markets even when I’m travelling and have no idea what I’d end up doing with it. Poor Drew would probably have ended up carrying a crate of cherrys for the rest of the day. Jan, I would have been tempted to stay in the area too. The mountains and town look very inviting. I have to admit I do not know a lot about Eastern Europe. You post makes me think about all the great places that are out there (even though they are not in our consciousness). Makes me want to travel more. I know what you mean Ruth, I’ve started thinking about a road trip from Trebinje to Belgrade! Beautiful, expansive, lush landscape, Jan. I really like the feeling of openness – it’s quite refreshing. Trebinje looks definitely worth a visit! But I’m curious: what made the hotel so different from any other? Wow, one doesn’t often see articles on Trebinje. Strangely, I’ve been there as well, a few years ago. I wanted to have a look at Srpska and Trebinje was the nearest town to Dubrovnik airport. Wandered around and spent a night there. Lovely little town. Oh, simply wow, on the photos in this post. The two with mirrored images absolutely made me gasp they are so stunning and I love the journey following the yellow bus! Since we’ve been back home Jackie I’ve seen a few other posts on Trebinje and they all have the same photos of the reflections, so I guess the river is like that quite often! I loved Trebinje and would love to spend at least five days there with a car to explore the surrounding area further. What a great story – I vaguely remember hearing about Trevinje but it seems more like Mostar is the highlight of BiH. Did you try their wine? We think Balkan wine is amazing! Hi Linda, I didn’t taste the wine. 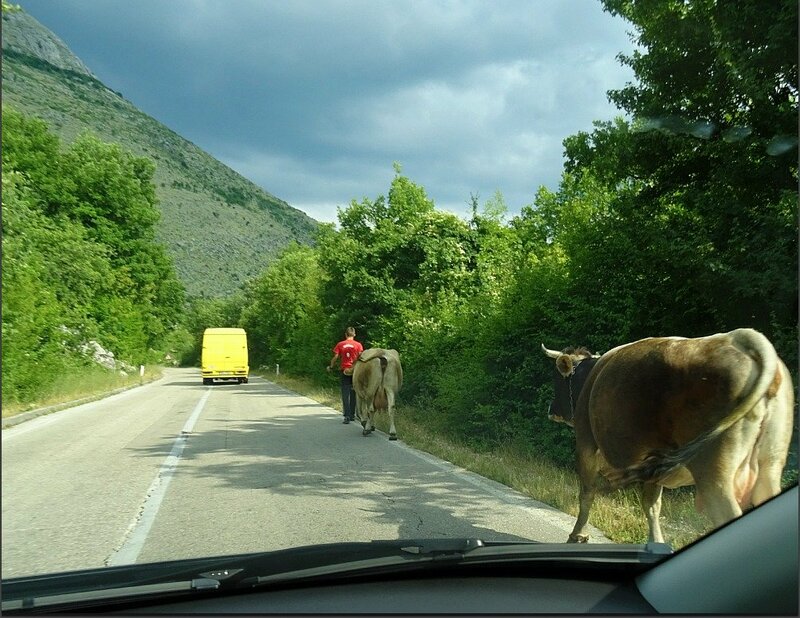 We only drove through BiH on our way from Croatia to Montenegro. I really wanted to see something of BiH and figured that any time there was better than none. 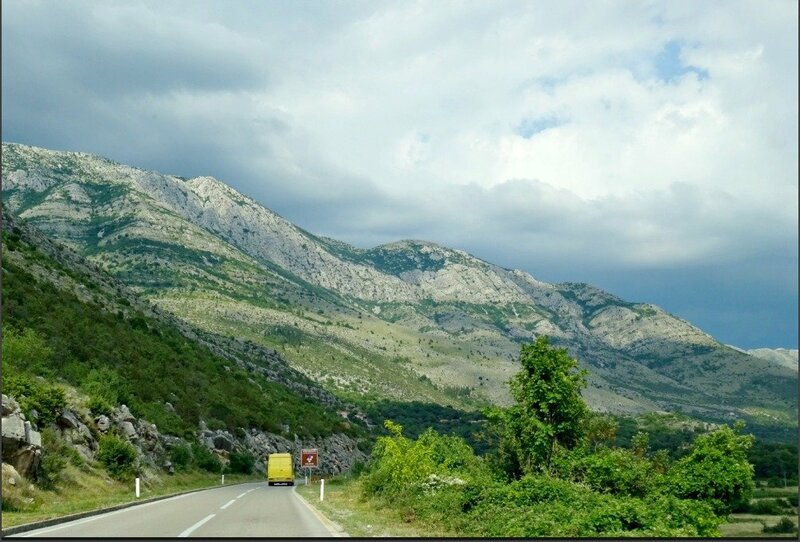 We drove along the Neretva River to Mostar, then Stolac and Trebinje, taking the inland route to Montenegro. I wanted to see Sarajevo but it was out of the question time wise. I enjoyed Trebinje, partly because it was off the tourist trail, but mostly because it was beautiful. So pretty quaint town you disovered enroute, no wonder you stopped which is the beauty of a self drive tour. I really love renting cars and exploring. 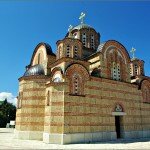 BiH was a highlight of our ten weeks in Europe mainly because it was not planned and it was a discovery tour. Why thank you Mrs. Poinker you are too kind. Seriously I loved our little detour through BiH and Trebinje was gorgeous. I love the tranquility of your pic of the cows on their way to milking taken through the windscreen of your vehicle. 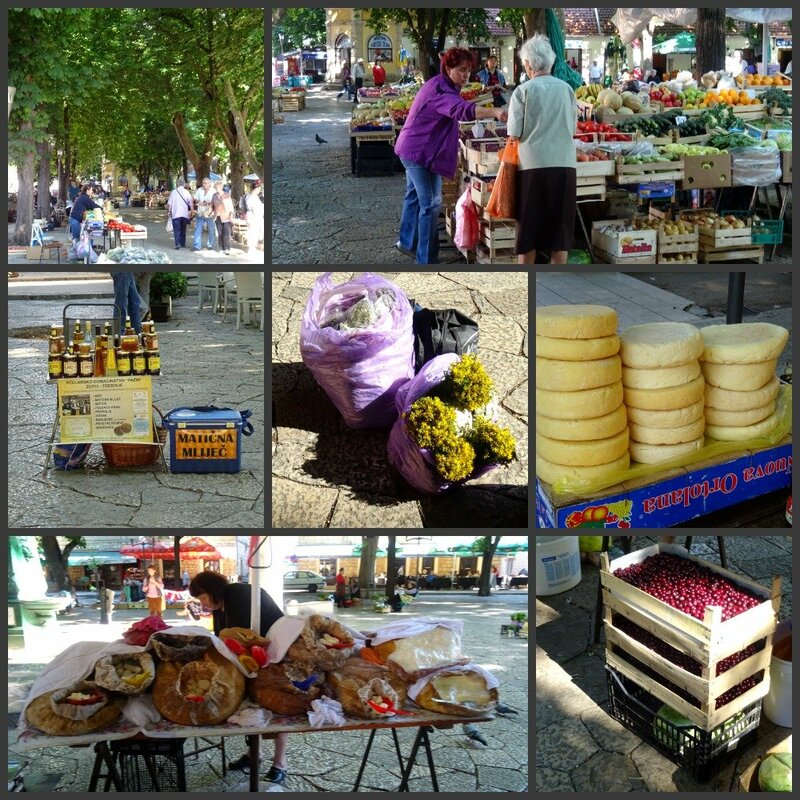 What a fascinating place Trebinje must have been to visit – I’ll bet the food from that market and the restaurant were wonderful. Wish we had more fresh food markets like that in WA. Such a surprising country Jo. I have really enjoyed your posts about this part of the world. Trebinje is certainly off the beaten track as far as tourist destinations go and as a result has a real charm about it. Love the photo of the old buildings mirrored in the river – just gorgeous! I do love that we got to visit Trebinje. We had no idea it would be so lovely.